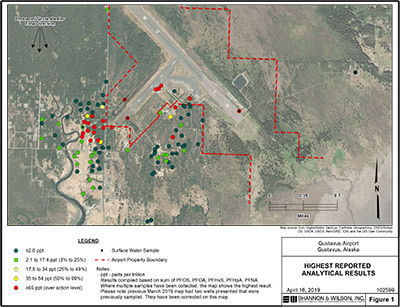 DOT&PF was alerted in late July 2018 to concentrations of Per- and Polyfluoroalkyl Substances (PFAS) in the groundwater at Gustavus Airport. The presumed source of PFAS in groundwater at the Gustavus Airport is the Federal Aviation Administration-mandated use of fire-fighting foams at Aircraft Rescue and Firefighting (ARFF) testing areas. 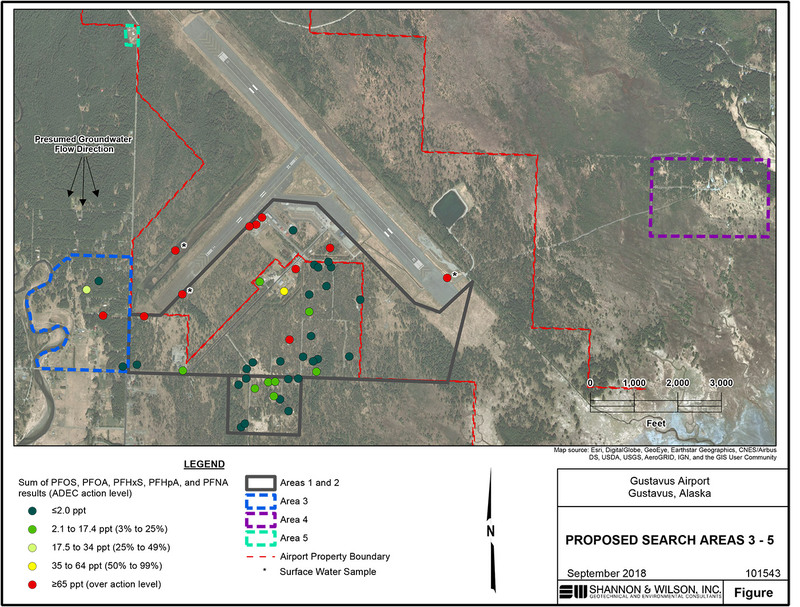 Since then, DOT&PF has worked with an environmental consulting firm, Shannon & Wilson, Inc., and the Alaska Department of Environmental Conservation (DEC) to identify and sample private water wells around the airport. Water sampling was conducted in August, late September / early October, and late October / early November 2018. Based on those samples, PFAS in 19 wells are reported in concentrations above DEC action levels. Of these, one well serves the Alaska Airlines and Alaska Seaplanes terminals, six wells are used for airplane washing or other non-drinking water uses, and 12 are private or business wells used for drinking water. One of these well results is due to city fire fighting foam use. Concentrations at many private wells and the well which serves the National Park Service water system are below DEC action levels. Many sampled wells show negligible PFAS levels. Based on sample results, the airport-generated plume boundaries appear to be identified within the shallow drinking water zone but further site characterization will confirm this. See community-wide results. To date, DOT&PF’s priority in Gustavus has been to identify and provide safe drinking water to those who need it. DOT&PF is providing alternative drinking water to homes with PFAS levels over 65ppt. Together with DEC and engineering consultants, DOT&PF has begun to assess options for long-term solution to provide clean drinking water. DOT&PF is also beginning site characterization, to determine the specific characteristics of the plume, spread, and influencing hydrology. In order to track PFAS movement in groundwater, DEC requires continued quarterly monitoring of wells with sample results above 35 parts per trillion (ppt) (in yellow on map) and annual monitoring of wells with sample results above 17.5 ppt (in light green on map).